Adam Miller is a minister at the Mayfield church of Christ in Saltillo, Mississippi. At one point, this congregation had two ministers working there who were both named Adam Miller (I can only imagine the fun and confusion during that time). Adam has graciously sent us “The History of the Mayfield Church of Christ, Saltillo, Mississippi,” a paper he wrote, for inclusion in the Jimmie Beller Memorial eLibrary. It has some interesting backstory, especially of a preacher named B.B. Sanders. And the growth that the congregation when it first began is simply phenomenal! 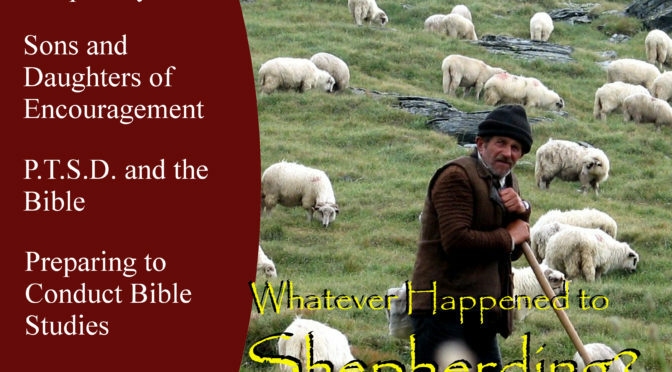 Misrepresentations and misunderstandings abound regarding the church. “You hate music.” “You hate women.” “You think water is more powerful than the blood of Jesus.” I’ve heard all these and more spouted by our “loving” and “understanding” denominational friends. For those who don’t know, a Unitarian is someone who believes that Jesus Christ is not deity (that designation only applying to the Father), that there was a time when Jesus was not (i.e., he was created), and that the Holy Spirit is a thing or a force, not a conscious being. Today, there are some small groups who hold that belief, and then there’s the so-called Jehovah’s Witnesses, who are probably the biggest group of Unitarians claiming to be Christ’s in existence today (note: one could make the argument that Muslims might fall into this category, but as they don’t claim to be Christ’s, they aren’t being considered). Why bring this up? Because back in the 1800s, some of the people involved in the Restoration Movement–people associated with Barton W. Stone, James O’Kelly, and others–had to defend themselves against this accusation. The problem arose because of some rather bold and self-promoting preachers in New England began to publicly espouse Unitarianism. One of them, Simon Clough, had become editor of one of the prominent papers in the Christian Connexion, and published a letter written to introduce the “Christian Church” to a Baptist group in England. In that letter (which can be seen here), he declared that the Christians were Unitarian in sentiment. The problem was that this wasn’t as widespread as Clough was letting on. In fact, this stance was viewed as heretical and anti-Christian by most of the “Christian Church” in the southern and western states. So, when a Methodist preacher wrote a book declaring all those in the Christian Connexion as Unitarians, it required a response. In it, he exposes the faulty reasoning of attributing to all, the views of a few; he explains why they believe in the Godhead, the Deity of Jesus Christ, and the Personality of the Holy Spirit, but refuse to use the theological word “trinity” or subscribe to the historic creedal descriptions and definitions of the Trinity. 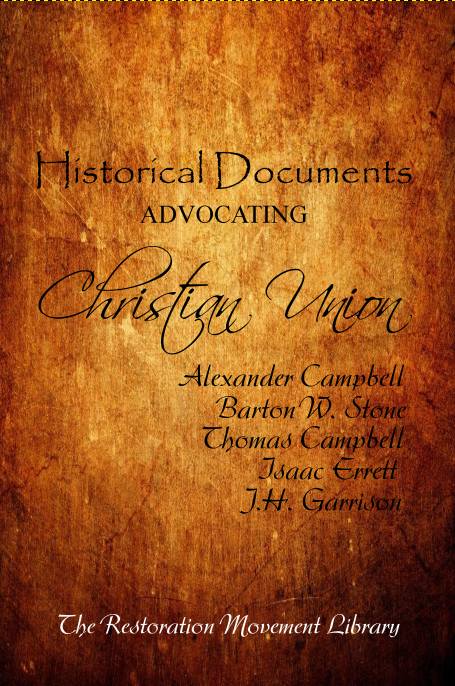 For those interested in Restoration Movement history, this book highlights some of the theological issues that caused Alexander Campbell concern, and caused Barton W. Stone problems. Understanding the topic contained therein helps to explain why much of the New England branch of the Christian Connexion didn’t join in the union between the “Reformers” and the “Christians,” as well as why there was a distinction between the southern and northern “Christians” who had years earlier given each other the right hand of fellowship. In all, it is an interesting read from both a historical and theological perspective. And you can download it below in a fully-reformatted, corrected (and searchable!) edition. Henderson, Tennessee, is well known for being the home of Freed-Hardeman University. But did you know that this symbol of conservative schooling was once in the control of those who favored the use of instruments of music in worship? And that the congregation there used instruments for a time? It might be hard to believe, but it’s the truth. Today, we are proud to present to you an unpublished manuscript by Grady Miller (preacher at Pikes Peak church of Christ) which deals with the division in the church at Henderson in January, 1903. Miller wrote this document while a student at Freed-Hardeman in 1975, and has graciously permitted us to post it here for you to read and enjoy. Please feel free to comment. All comments will be passed on to Mr. Miller. Lee Parish, who preaches in Marlow, Oklahoma, was kind enough to send a paper he wrote in 2013 on David Lipscomb to be placed in the Jimmie Beller Memorial eLibrary. The paper looks at David Lioscomb’s life in the following headings: (1) His Early Years, (2) Not a Preacher, (3) The Civil War, (4) His Prolific Pen, (5) The Greatest Man on the Continent, (6) “Aunt Mag”, and (7) A Life that Lives On. He does send a note along with it, that his “works cited” page somehow disappeared. But the references are scattered throughout the paper. History is a hobby of mine. Especially church history. But I’m not alone in that hobby. Joshua Dement, who lives and works in Northeast Arkansas, is quite the history buff as well, and he specializes in researching the history of congregations in his area. Today, thanks to brother Dement’s kind permission, we will be presenting a portion of his research, showing the Restoration Movement in action in the planting of several congregations in that part of the state. If you happen to have more information about the congregations or individuals mentioned therein, I’m sure Joshua would love to hear from you. Send a note via our contact page, and I’ll make sure it gets to him (don’t want to just publicize his email address for the world to see, you know). Guy N. Woods, Gus Nichols, Franklin Camp, Batsell Barrett Baxter, Cleon Lyles, David Lipscomb, G.C. Brewer, N.B. Hardeman, H.A. Dixon, G.K. Wallace, Foy E. Wallace. What do these names have in common? They are all subjects of chapters in the book, Great Preachers of the Past! And thanks to the kind folks at the Southeast Institute of Biblical Studies (formerly East Tennessee School of Preaching), we are making it available as a free download in the Jimmie Beller Memorial eLibrary. To read it online, or to download for later perusal, just click the link below! Yes, we are still alive and kicking (though not so high right now, after some of us got badly sunburned on the feet…). We don’t have any news to report, except that God is taking care of us quite well (as always) while we are trying to figure out where he wants us to be. Today, I realized that there are some books that I had already prepared to be added to the Jimmie Beller Memorial eLibrary, and simply forgot to actually add them. So, today, you get a short book called “An Account of the Christian Denomination in the United States” by Simon Clough. Clough was a preacher in the “Christian Connexion,” which boasted Abner Jones and Elias Smith as some of its most prominent early preachers. In essence, it is a letter written in 1827 to explain their beliefs, history, and practices in response to the inquiry of the General Baptists of England. 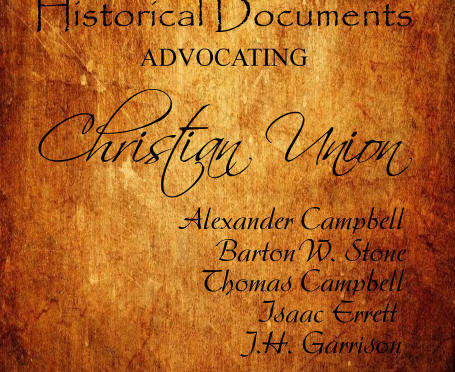 It was just four years later that a large segment of the Christian Connexion (the part which worked with Barton W. Stone) formally united with the “Reformers” (including Alexander Campbell, Raccoon John Smith, and Walter Scott,). Clough, however, was not a party to this union, and actually opposed it. Today, we are offering you yet another freebie, added to the Jimmie Beller Memorial eLibrary. This one is called, “A Sketch of the Life of James A. Garfield.” President Garfield, as many of you may know, was a Christian, a preacher, a teacher at a “Christian school,” and helped to create The Christian Standard. So, without further talking from me, here it is! 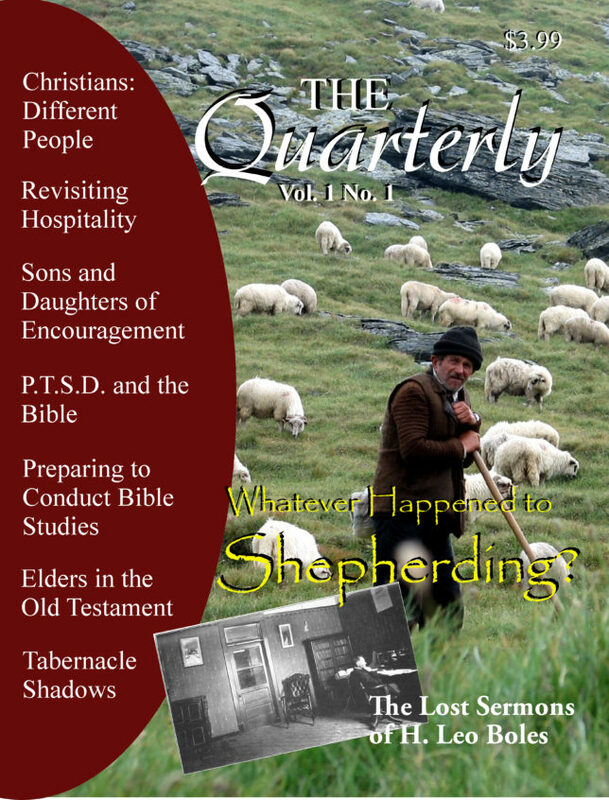 The first official issue of the Quarterly is now available! If you already subscribe, then look for your copy to arrive this week. If you don’t already subscribe, but want to, you can do that here. If you want just a single issue, you can get it on Amazon by clicking here. Thanks for all your support and for reading what we have to write! There will be more real articles coming soon! We’ve got some new free stuff for you! This book contains the most important documents of the early Restoration Movement writers, as well as a couple second and third generation writings. Also included are introductions to each document/writer by Charles A. Young. 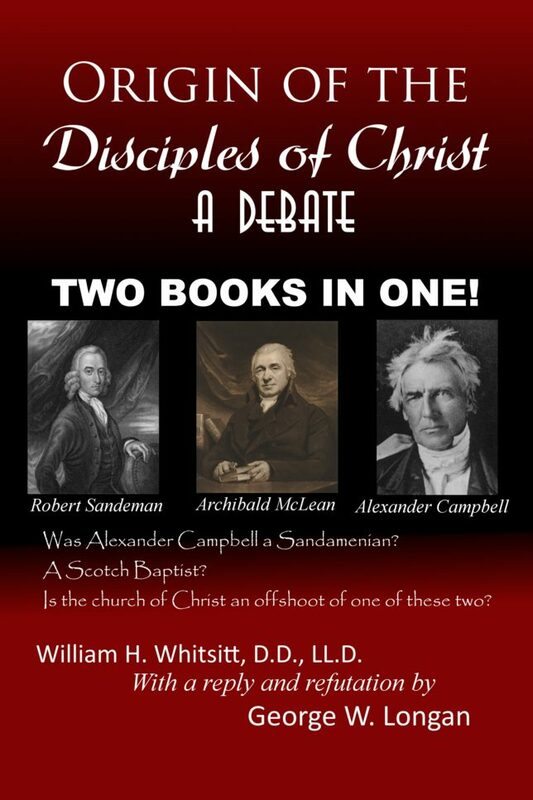 William Whitsitt was a Baptist professor whose stated purpose was to prove that the church of Christ (known popularly as “the Disciples of Christ”) was nothing more than the offspring of the Sandemanians, a group which Baptists and some others had labelled as heretics years earlier. George W. Longan, a preacher of the gospel, wrote a book of in reply, exposing the ludicrous reasoning (if such it could be called) of Whitsitt, and made it abundantly clear by also including scathing reviews of Whitsitt’s book–reviews that were written by his own Baptist brethren! Updated, with a whole bunch of brand-new footnotes by yours truly. BOTH of these books are now available in the Jimmie Beller Memorial eLibrary (look under the “Restoration Movement” heading).